Source: CICH graphic created using data adapted from Statistics Canada. Diverse family characteristics of Aboriginal children aged 0 to 4. Census in Brief. Census of Population, 2016. http://www12.statcan.gc.ca/census-recensement/2016/as-sa/98-200-x/2016020/98-200-x2016020-eng.cfm -accessed October 20, 2017. In 2016, 60% of Indigenous children aged 0 to 4 lived in a family with two parents. 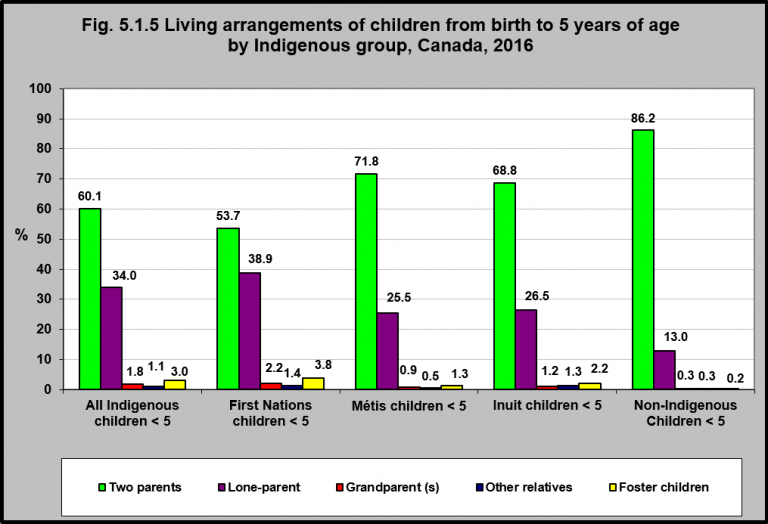 Fifty-four per cent of First Nations children under 5 lived with two parents, as did 72% of Métis and 69% of Inuit children in this age group. More than one-third of Indigenous children aged 0 to 4 lived with a lone-parent. This was the case for 39% of First Nations, 26% of Métis and 27% of Inuit children in this age group. Indigenous children accounted for 7.7% of all children aged 0 to 4, and about one-half of all foster children in this age group. 1Lafrance, J., & Collins, D. (2013). Residential schools and Aboriginal parenting: voices of parents. Native Social Work Journal, 4(1), 104-125.